The Fies Files: Book Launch! People have been asking (no, really! 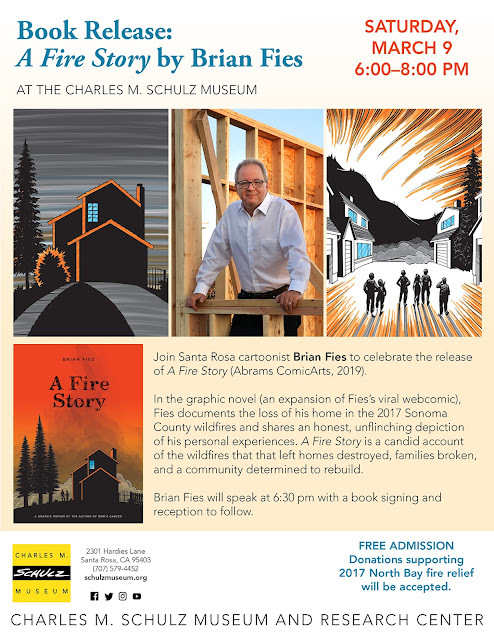 ), and now it can be told: We're kicking off the release of "A Fire Story" with a talk and booksigning at the Charles M. Schulz Museum in my hometown of Santa Rosa, Calif. on March 9 from 6 to 8 p.m. I can't think of a more perfect place from which to launch, and Jeannie Schulz and the museum staff have been incredibly kind and gracious. My publisher Abrams and I are planning several other appearances at bookstores and conventions in both the North Bay and farther afield. I think we'll be announcing that full schedule next week. It's gonna be a busy spring! This book will be added to my collection soon. My husband grew up in Sonoma and it was surreal when this fire went through. Our son is a wildland firefighter, so this whole fire business is close to our heart. Fire season grows longer and scarier each year. Thank you (in advance) for sharing.